The Arab - Israeli wars are considered to be a series of conflict between Israeli and various Arab forces, most notably from 1948 through 1982. The war commenced when the British terminated its mandate over Palestine and the Jewish community immediately declared independence on May 15, 1948, of a new state - Israel. The fighting took place mostly on the territory of the British Mandate in Palestine and for a short time also in the Sinai Peninsula and Southern Lebanon. Much of what Arabs refer to as The Catastrophe occurred amidst this war. The conflict is actually between two communities the Palestinian Arabs and Zionist (now Israeli) Jews. Both the communities have different religions but the conflict is not primarily on religious but on the control over land. The conflicted zone was internationally known as Palestine which was under the British Mandate. After the first war or the War of Liberation, Palestine was designated as ‘the Holy Land’ by both the communities. After the war, this land was divided into three parts; the State of Israel, the West Bank (of the Jordan River) and the Gaza Strip. The ancient kingdoms of Israel and Judea were inhabited by Jews and had been successively conquered and dominated by several foreign empires. In 135 CE, the Roman Empire defeated the third revolt against its rule and consequently expelled the surviving Jews from Jerusalem and its surroundings. The Roman province was then renamed "Palestine". The Arab conquered Palestine in the 7th century and the remaining inhabitants were mostly assimilated into Arab culture and Muslim religion. Palestine retained Christian and Jewish minorities, the Jews were especially living in Jerusalem. The land was thus ruled by several Arab empires and became part of the Ottoman (Turkish) Empire in 1516. Jewish claims are based on the biblical promise to Abraham and his descendants and also on the fact that the land was the historical site of the ancient Jewish kingdoms of Israel and Judea. The Jews were also in need for a haven from European anti-Semitism movement. Palestinian Arab claims to the land are based on their residence in the country for hundreds of years and also on the fact that they represented the demographic majority until 1948. The Arabs reject the notion that a biblical-era kingdom is a basis for a valid modern claim. And if Arabs go by the biblical argument, they maintain that since Abraham’s son Ishmael is the forefather of the Arabs, then the promised land also include the Arabs as well. They strongly reject the idea that they should forfeit their land to compensate the Jews for Europe’s crimes against Jews. Zionism rose as a nationalist and political movement in the late nineteenth century in Europe which aimed at restoring Israel as a national home for the Jewish people. After the end of Second World War, the victims of Holocaust mostly from Eastern Europe and Yemen started migrating to Palestine (called Aliyah or going up). The movement saw Jewish national independence as the only answer to anti-Semitism and to the centuries of persecution and oppression by the Europeans in exile. The first Zionist Congress took place in Basel 1897 as a correlated work of an Austrian journalist Theodor Herzl, who in his book The Jewish State had imagined a state for the Jewish people, in which there would be a light unto the nations. In the initial form, Zionism was a secular movement, but it primarily referred to the religious and cultural ties with Jerusalem and ancient Israel. Most Orthodox Jews initially believed that only the Messiah could lead them back to the ‘promised land’. By the beginning of the 20th century, Jews in Palestine were originally inhabited in four cities with religious significance: Jerusalem, Hebron, Tiberias and Safed. Most of the original inhabitants had been there to observe traditional, orthodox religious practices only. They spent their time studying religious texts and depended on the charity of world for survival. Their attachment to the land was religious rather than national, and they did not involve nor supported the Zionist movement that began in Europe. But most of the Jews who emigrated from Europe were secular and were committed to the creation of a modern Jewish nation and the goals of building an independent Jewish state. By the commencement of World War, I (1914), the population of Jews in Palestine had risen to about 60,000, about 36,000 of whom were recent settlers. The Arab population in 1914 was 683,000. During 1915–1916, the British high commissioner in Egypt, Sir Henry McMahon, secretly signed with Husayn ibn ‘Ali, and convinced Husayn to lead an Arab revolt against the Ottoman Empire. The Ottoman Empire was aligned with the Axis power in the war. In return, McMahon promised that the British government would definitely support the establishment of an independent Arab state under Hashemite rule in the Arab provinces of the Ottoman Empire which also included Palestine. The Arab revolt, led by Husayn’s son ‘Faysal’ and T. E. Lawrence (“Lawrence of Arabia”) successfully defeated the Ottomans. But Britain had also made other promises during the war. The British foreign minister, Lord Arthur Balfour, in 1917 issued a declaration, also known as the ‘Balfour Declaration’. This declaration forecasted the British support of the Zionist mission for the establishment of “a Jewish national home in Palestine”. There was another secret deal between the British and the France in the form of the Sykes-Picot Agreement, to carve up the Arab provinces of the Ottoman Empire and divide control. After the war, Britain and France established their mandates to control the parts of Ottoman Empire which were defeated. France managed to obtain a control over Syria and carved out Lebanon as a separate state with a slight majority of Christians. Britain obtained a mandate and controlled Iraq and parts the area that now comprises Israel, the West Bank, the Gaza Strip and Jordan. In 1921, the British divided Jordan into two parts: East of the Jordan River which became the Emirate of Transjordan, was under the rule of Faysal’s brother Abdallah, and west of the Jordan River became the Palestine Mandate. Palestine became a unified political entity for the first time in modern history. Throughout the Middle eastern region, Arabs were furious against Britain’s failure to fulfil its promise to create an independent Arab state. As a result, many opposed the British and French control over the region as a violation of Arabs’ right to self-determination. The condition was more complicated and worse in Palestine because the British had also promised to support the cause of Zionist movement in the creation of a Jewish national home. There were a mass migration of European Jewish holocaust survivors and began to buy and settle in Palestine which generated increasing resistance by Palestinian peasants, journalists and political figures. They feared that the Jew immigrants would eventually lead to the establishment of a Jewish state in Palestine. Palestinian Arabs opposed the British Mandate because it caused an impediment to their aspirations for self-rule. They also opposed mass immigration of the Jews because it threatened their position in their homeland. Jewish immigration from Europe to Palestine increased significantly after Hitler’s rise to power in Germany (1933). Palestinian resistance to British control and movement against Zionist settlement climaxed with the Arab revolt of 1936–1939. The British successfully suppressed the Arab resistance with the help of Zionist militias. After suppressing the Arab revolt, the British reconsidered their governing policies in an effort to maintain order and they issued the White Paper in 1939, a statement of government policy which would limit all of the future Jewish immigration and land purchases. The Zionists regarded the White Paper as a betrayal of the Balfour Declaration and as a fraudulent act in the hour of the desperate situation of the Jews in Europe. The 1939 White Paper also marked the end of the British-Zionist alliance. In 1945, under the British influence, Egypt, Iraq, Lebanon, Saudi Arabia, Syria, Transjordan, and Yemen formed the Arab League to coordinate policy between the Arab states. After the end of Second World War, on May 14, 1948, the British Mandate of Palestine came to an end. Transjordan, under Abdullah I, gained independence from Britain in 1946 and was renamed as Jordan, but politically remained under the heavy influence of the British. Egypt also signed the Anglo-Egyptian Treaty 1936, which included provisions under which Britain would maintain troops on the Suez Canal. On November 29, 1947, the United Nations General Assembly decided to adopt the Resolution 181 ‘the Partition Resolution’ that would divide Britain’s former Palestinian mandate into Jewish and Arab states. According to the resolution, the area of religious importance around Jerusalem would remain under international control as corpus separatum administered by the aegis of United Nations. The Palestinian Arabs refused to recognize this arrangement, which they regarded as favourable to the Jews and unfair to the Arab population. After the British left Palestine on May 15, 1948, the Zionist leaders announced their independence and proclaimed the State of Israel. Neighbouring Arab states including Egypt, Syria, Jordan and Iraq invaded Israel, claiming that they were on a mission to save Palestine from the Zionists. During May and June of 1948, when the fighting was most intense, the result of this first war was in doubt. Initially, the Palestinian Arabs had better weaponry and more troops, but that significantly changed after the first cease-fire. The Zionists used this opportunity to organize and train their newly established army, the Israeli Defense Forces. Then the Jews ultimately won their War of Independence with better support and intelligence. In 1949, the Arab-Israeli war states ended with the signing of armistice agreements. The country which was once known as Palestine is now divided into three parts with each under a different political regime. The State of Israel comprised over 77% of the territory between the Jordan River and the Mediterranean Sea. Jordan occupied East Jerusalem and the hill country of central Palestine which was known as the West Bank. Egypt took control of the coastal plain around the city of Gaza which is known as the Gaza Strip. The Palestinian Arab state envisioned by the UN partition plan was never established. The city of Jerusalem was now divided. The Old City came under Jordanian control and a tiny Jewish enclave (Mount Scopus) in the Jordanian part. Jews were not allowed to enter the Old City and go to the Wailing Wall. Jordan annexed the West Bank and East Jerusalem in 1950 which was only recognized by Britain and Pakistan. The Palestinian Arabs living in the area now under Israeli control had fled or were expelled and over 400 of their villages had been destroyed. The Jews living in the area under Arab control including East Jerusalem, Hebron, Gush Etzion had also all been expelled. Due to the civil war, the Jewish minorities in all Arab countries either fled or were expelled, most of whom went to Israel, the US and France. These Jewish refugees were all relocated in their new home countries. However, in contrast, the Arab countries refused to provide a safe haven for the Palestinian Arab refugees, because they maintained that they had the Palestinian Arabs right to return to Israel. Israel also rejected the Palestinian ‘right of return’ as it would eventually result in an Arab majority in Israel. The question of the Palestinian right of return is the first major obstacle for solving the Arab-Israeli conflict. More tensions were aggravated with the rise to power Gamal Abdel Nasser as the Egyptian President, a staunch Pan-Arab nationalist. Nasser was hostile stance toward Israel. The Suez Crisis was a Cold war’s child and also a significant event in the Arab- Israeli conflict. The American and British decided not to finance Egypt’s construction of the Aswan High Dam, as they had promised, in response to Egypt’s growing ties with communist Czechoslovakia and the USSR. Nasser reacted to the decision by declaring martial law in the Suez Canal zone and seized control of the Suez Canal Company. He directed that the tolls collected from ships passing in the waterway would have to pay for the dam’s construction within five years. This caused confusion and frantically, Britain and France feared that Nasser might close the canal and cut off petroleum shipments from the Persian Gulf to western Europe. Diplomatic negotiations and efforts failed. Then, Britain and France secretly prepared joint military action with Israel to regain control of the canal and to depose Nasser, if possible. As a result, Nasser decided to nationalize the Suez Canal. Great Britain and France responded by striking a deal with Israel wherein Israel would invade Egypt. France and Britain would then intervene as peacemakers, and take control of the canal. Israel successfully invaded Egypt’s Sinai Peninsula in October 1956 and within five days, the Israeli army captured Gaza, Rafaḥ, and Al-ʿArīsh occupying most of the peninsula east of the Suez Canal. The Israelis were then in a position to open sea communications through the Gulf of Aqaba. Soviet premier Nikita Khrushchev rallied against the invasion and threatened to force down nuclear missiles on Western Europe if the Israeli-British-French troops did not withdraw. The President Dwight Eisenhower’s administration stepped in and warned the Soviets that talk of nuclear conflict would only make matters worse, and cautioned Nikita Khrushchev to refrain from engaging direct intervention in the conflict. However, Eisenhower firmly warned the French, British and the Israelis to give up their campaign and withdraw from Egyptian soil. Eisenhower was not happy, particularly with the British, for not keeping the US informed about their intentions. The US threatened all three nations with dire economic sanctions if they continued in their attack. The British and French forces withdrew by December and Israeli forces withdrew in March 1957 under the guidance of a UN Emergency Force which was sanctioned in the Canal area. Though Egyptian forces had been virtually defeated on all fronts, the Suez Crisis was seen by Arabs as an Egyptian victory. In the spring of 1967, the USSR misinformed the Syrian government that Israeli forces were mobilizing in northern parts of Israel to attack Syria. Already, clashes between Israel and Syria had been escalating and Israeli leaders had been announcing in the public that they might prompt to bring down the Syrian regime, if necessary, in cases of its failure to end Palestinian guerrilla attacks from Syrian territory. In May 1967, Egyptian troops entered the Sinai Peninsula bordering Israel as a response to the Syrian request for assistance. Nasser then asked the UN observer forces installed between Israel and Egypt to return back from their positions. The Egyptian forces under Nasser occupied Sharm Al-Sheikh which is the southern tip of the Sinai Peninsula and blocked the Israeli port of Eilat on the Gulf of ‘Aqaba. Egypt’s argument was based on the fact that the access to the Eilat port lies in the Egyptian territorial waters. After diplomatic efforts and further negotiations failed to resolve the deadlock, Israel attacked in June of 1967 and conquered the Gaza Strip and took back the Sinai Desert from Egypt, the Golan Heights from Syria and the West Bank and East Jerusalem from Jordan. Israel was more than willing to return most of the region in exchange for peace, but the Arab countries refused to negotiate peace and announced at the Khartoum Conference to continue to exert their goal of destroying Israel at the Khartoum conference. The war of 1967, which lasted for six days confirmed Israel as the dominant regional military power. However, the Palestinian Arab national movement emerged as a major actor in the form of a political and military organization known as the Palestine Liberation Organization PLO after 1967. The Six-Day War brought one million Palestinian Arabs under Israeli rules. After 1967, the focus of the Palestinian resistance shifted to liberating the West Bank and the Gaza Strip which was seen as a necessary step in the direction of liberating Palestinians. They started to manifest themselves as a people and to demand an independent state. Yom Kippur War of 1973 is the fourth of the Arab-Israeli Wars and is also known as the October War, the Ramadan War. It was initiated by Egypt and Syria on October 6, 1973, the Jewish holy day of Yom Kippur and during Ramadan, the fasting month in Islam, and continued until October 26, 1973. The war eventually summoned both the US and the Soviet Union into an indirect confrontation in defence of their respective allies. It was launched with the diplomatic aim of convincing Israel to negotiate on terms more favourable to the Arab countries. In 1971, the new Egyptian President, Anwar al-Sadat categorically advanced to UN envoy Gunnar Jarring stating that he was willing to sign a peace treaty with Israel in exchange for the return of Egyptian territory lost in 1967 war at the Sinai Peninsula. Israel frantically ignored this truce which provoked Egypt and Syria. Therefore, Egypt and Syria decided to act to break the political standstill. They deliberately attacked Israeli forces in the Sinai Peninsula and the Golan Heights in October 1973. It was a surprise attack which caught Israel off guard, and the Arabs achieved some early military victories. This turn of events prompted American political intervention, along with significant increase in military aid to Israel. The Israeli Prime Minister, Golda Meir went to the US for aid, while the Israeli general staff improvised a battle strategy. The US was reluctant to extend help but the decision changed rapidly when the Soviet Union began to resupply military aid and efforts to Egypt and Syria. At this stage, U.S. Pres. Richard Nixon then decided to counter by establishing an emergency supply line to Israel, despite the Arab countries imposing a costly oil embargo and various U.S. allies refusing to facilitate and aid the arms shipments. With the help of US reinforcements, the Israel Defence Forces rapidly turned the tide which resulted in Israel succeeding in disabling portions of the Egyptian air defences, which allowed Israeli forces to cross the Suez Canal and surround the Egyptian Third Army. And on the Golan front, Israeli troops pushed back the Syrians and advanced to the edge of the Golan plateau on the road to Damascus. On October 22, 1973, the UN Security Council adopted resolution 338. It called for an immediate termination to the fighting; despite this, however, conflict continued for several days and finally ceased on October 26. A UN peacekeeping force finally established a buffer zone between the two countries’ armies and was supplemented by another agreement, signed on Sept. 4, 1975. Finally, on May 31, 1974, Israel and Syria signed a ceasefire agreement which covered separation of their military forces by a UN buffer zone and facilitates exchange of prisoners of war. In June, the oil embargo was also lifted. With significant casualties and a large number of military equipment destroyed, the war proved costly and futile for Israel, Egypt, and Syria. Although Egypt did not win the war in any military sense, nevertheless, its initial successes in October empowered President Sādāt to pronounce the war an Egyptian victory. In September 1978, President Jimmy Carter invited Egyptian President Sadat and Israeli Prime Minister Menachem Begin to the Camp David presidential retreat in Maryland. They worked out two agreements: a framework for peace between Egypt and Israel, and a general framework for the resolution of the Middle East crisis. Which was to cater to the Palestinian question. The first agreement formed the basis of the Egyptian-Israeli peace treaty which was eventually signed in 1979. The second agreement presented to grant autonomy to the Palestinians in the West Bank and the Gaza Strip for a five-year interim period, after which the final status of the territories would be negotiated. Only the Egyptian-Israeli negotiation part of the Camp David accords was implemented. The Palestinians and other Arab states rejected the autonomy concept because it did not guarantee full Israeli withdrawal from areas captured in 1967 or the establishment of an independent Palestinian state. But Israel continued to sabotage negotiations by continuing to illegally annex Palestinian lands and build new settlements by violating the commitments Menachem Begin made to Carter at Camp David. In December 1987, the Palestinian Arabs in the West Bank and Gaza began a surprise mass uprising against the Israeli population. This uprising is known as intifada (shaking off) in Arabic and was not started or organized by the PLO leadership. Rather, it was a popular mass mobilization that collected on the organizations and institutions that had developed under their occupation. The first intifada began in December 1987 and ended on September 1993 after the signing of the first Oslo Accords, which presented a framework for peace negotiations between Israel and the Palestinian Arabs. The mass uprising involved thousands of people, many with no previous violent experience, including children and teenagers. Initially, it was in the form of civil disobedience including massive demonstrations, general strikes, refusal to pay taxes, boycotts of Israeli products, political graffiti and the establishment of underground “freedom schools”. It also included active stone throwing, Molotov cocktails and the erection of barricades to impede the movement of Israeli military forces. Intifada activism was organized through popular committees under the umbrella of the United National Leadership of the Uprising. This broad-based resistance drew unprecedented international attention to the situation facing Palestinians in the West Bank and Gaza and challenged the occupation as never before. The intifada firmly established that it was politically and economically damaging to Israel, therefore, a new Israeli government was elected in 1992 with a mandate to negotiate for peace. Next year, secret talks between Israel and the PLO under the auspices of the Norwegian government resulted in the crafting of the Oslo Accords which is a series of agreements signed between 1993 and 95. The accords illustrated the PLO’s 1988 commitments, and Israel recognized the PLO as the Palestinian people’s legitimate representative. They also agreed to withdraw in stages from areas of the West Bank and Gaza and allowed the creation of a Palestinian Authority to exercise power in those areas. In, 1994 a Palestinian National Authority (PNA) was established under the leadership of Arafat and the PLO. The second intifada was more violent than the first intifada. During the approximately five-year uprising. The problems with the “peace process” at the Oslo Accords, combined with the frustrations and humiliations inflicted upon Palestinians in the Occupied Territories, as well as corruption in the Palestinian Authority finally led to another massive riot and uprising in late September of 2000. During the first three weeks of the intifada, Israeli forces shot 1 million live bullets at unarmed Palestinian agitators. It was a conscious escalation in the use of force designed to avoid a civil uprising, like the first intifada, and the international sympathy, it won the Palestinians. On some events, armed policemen often camped at the rear of unarmed demonstrations and returned fire. As a reaction to the Israeli forces, in November 2000, Hamas and Islamic Jihad, and then later the Fatah-affiliated al-Aqsa Martyrs Brigade, began conducting suicide bombings and other armed operations. There were over 150 attacks from 2000 through 2005, compared to 22 incidents from 1993 to 1999 by Islamist opponents of the Oslo process. To advance the goal of the independent state of Palestinians living side by side with the Israelis, the Bush administration proposed a “road map”. It began with mutual steps, including a complete termination to violence and political reform by the Palestinian Authority and withdrawal from Palestinian cities and a settlement by Israel. The road map’s implementation was to be supervised by a Quartet composed of the United States, Great Britain, Russia, and the UN. After the road map was announced on April 30, 2003, Israel submitted a list of 14 reservations. Although this list amounted to a rejection of the plan, the Bush administration pretended that both parties accepted it and renewed peace talks began on July 1. Negotiations soon stalled, however, due to an escalation of violence. Despite the conditions of the road map, Israeli Prime Minister Sharon began to realize that Israel could not remain a Jewish state and indefinitely control of millions of Palestinians. In 2004, he announced the withdrawal of Israeli forces unilaterally from the Gaza Strip. The Bush government of the US also supported this plan. However, he did take unilateral measures such as the disengagement from the Gaza Strip in 2005, but he demanded an end to Palestinian terrorism before he would engage in negotiations with Arafat’s successor Abbas concerning final status issues. Mahmoud Abbas, the chairman of the PLO, petitioned twice to the UN to accept Palestine as a member state. In September 2011, he approached the UN Security Council and asked for a full membership for Palestine. Unfortunately, the petition did not receive the nine required votes. On November 29, 2012, the sixty-fifth anniversary of UN General Assembly Resolution 181, partitioning Palestine, Abbas requested the UN General Assembly to accept Palestine as a non-member observer state, the same status enjoyed by the Vatican (and Switzerland before it joined the UN). This request was overwhelmingly approved with 138 votes in favour and 9 against, with 41 abstentions. However, the vote had no effect on the ground reality as Israel continues to occupy the West Bank and the Gaza Strip. It did, nevertheless, open the conjecture that Palestine could approach the International Criminal Court (ICC) to pursue Israeli officials for violence and crimes committed in the course of the occupation. International opinion is nearly unanimous that a two-state solution, including a sovereign Palestinian state, is the best if not the only way forward in the century-old conflict over historical Palestine. Yet there is no visible movement toward achieving this outcome. There are four issues that have been the most challenging for achieving “a two-state solution”: Borders, Jerusalem, Refugees, and Security. These issues could be resolved through negotiations and making concessions. There are three main reasons why there can be challenges in the negotiations. One reason is the shift in Israeli Jewish opinion since the outbreak of the second intifada that no peace is possible with the Palestinians. They feel that there is a need to pursue ‘conflict management’ strategy rather than ‘conflict resolution’. Recent Israeli governments have been unwilling to negotiate in good faith. A second reason is a split between Abbas and Hamas in the Palestinian body politic which results in the division among ordinary Palestinians. Meanwhile, Palestinian of Israel and the corresponding refugees in neighbouring Arab countries are adamant that a comprehensive peace must also include them. There are pressing questions about the viability of the two-state vision and even the utility of international law for delivering a minimally just “solution” to the question of Palestine. The third reason is the lack of political will in the US administration. In the spring of 2013, former Secretary of State John Kerry began traveling frequently to the Middle East in an effort to restart Israeli-Palestinian negotiations aimed at a two-state solution. He succeeded in doing so, and at the time of writing maintains a brave face in public about the possibility of success. There is no indication, however, that a peace agreement is on the horizon. 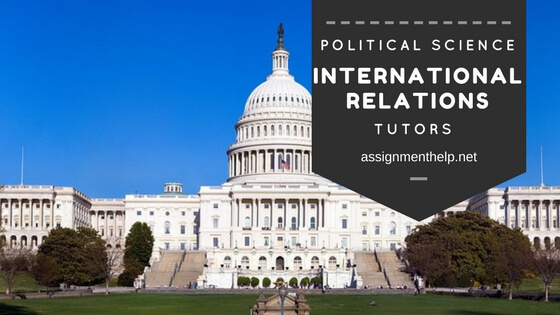 Need expert online political science and international relations tutors to help you understand the functioning of governments and politics behind international relations topics like the Arab-Israeli Wars, NATO, Nuclear disarmament, Theories of Political realism and more? Then Assignmenthelp.net is the best website for you. With over 1000 experts ranging across subjects like Politics, Governance, Public Administration, US Government, UK government and politics, comparative politics, political science theories, international studies, international relations and more such topics of humanities and social sciences, Assignment is the best place to get political science homework help and ace your homework assignments with the bests results. Our expert government and politics tutors provide online homework help and assignment writing help to students from across the globe in countries like USA, UK, Australia, Canada, UAE, Singapore, Malaysia and more. Our academic assignment writing help services include, college essay writing, political science, homework help, political science thesis writing and editing services, political science tutors to help with international relations dissertations on as well as any general college essay writing assignment homework and term papers on political science and international relations.